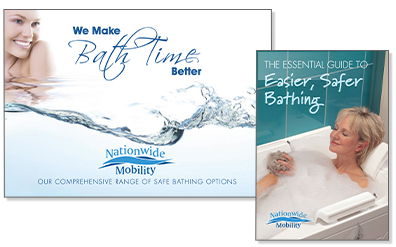 Nationwide Mobility are pleased to offer you 4 different types of walk in baths all of which you can easily step into for a luxurious soak once again. Make bathing difficulties a thing of the past. The Simplicity walk in bath could provide the perfect solution to all of your bathing needs. With a cleverly designed door the Simplicity is easy to use and allows you to enjoy a full length soak or take a shower with ease. The Simplicity is also available with an optional state of the art power seat which can be easily removed to allow your family or guests to use the bath. The beautifully contoured Ultimate walk in shower bath is amazingly versatile with all the features, safety and ease of use of the Simplicity bath but with an elegantly designed extra roomy shower area. The Ultimate also comes with the option of the easily removable power seat. The specially contoured walk in Aquabath offers noticeably more bathing area than other similar walk in baths allowing you to enjoy a deeper more satisfying bath. The easy access door and safe seating position make the Aquabath a popular choice. The Mini Marvel has all of the features of bigger walk-in-baths but is cleverly designed to fit into the smallest of bathrooms. Just walk in, sit down and enjoy a safe and relaxing bathing experience. Nationwide Mobility walk in baths are designed to give you a safe and comfortable bathing experience with that little touch of luxury. If you want to rediscover the joy of a safe, long hot soak then one of our walk in baths could be for you. Whichever you prefer, the best way for you to choose is to discuss your particular needs with one of our Nationwide advisors in the comfort of your own home. He or she will be able to talk you through our range of products and the options available to enable you to choose the one which would best suit your needs. Once you have made your choice we will manufacture your walk in bath and then usually fit it within a day with the minimum of fuss. To talk to one of our advisors just call on 0800 316 0116 and we will be happy to help.